From the critically acclaimed author of Crooked River comes this fascinating novel about a young woman searching for answers about events that transpired ten years before when her brother disappeared without a trace--an utterly mesmerizing psychological thriller. Lucy Durant was only fourteen-years-old when she lost her older brother. First to his paranoid delusions as he became increasingly obsessed with UFOs and government conspiracies. Then, permanently, when he walked into the desert outside Bishop, California, and never returned. Now on the tenth anniversary of Nolan's mysterious disappearance, Lucy is still struggling with guilt and confusion--her memories from that period are blurry and obscured by time, distance, and alcohol. Now an adult, she's stuck in a holding pattern, hiding out at her father's house, avoiding people, and doing whatever she can to keep herself from thinking about Nolan. But when a series of unsettling events leads Lucy back to Bishop, she is forced to reconcile with her estranged mother and come to terms with the tangled memories of her past to discover what really happened to her brother all those years ago. 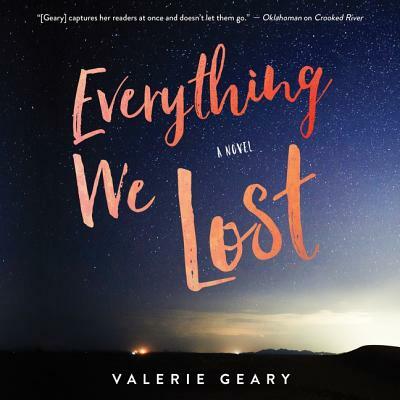 Told in Lucy and Nolan's alternating voices, Everything We Lost is a psychological mystery exploring family, beliefs, obsessions, the nature of memory, and fear of the unknown--a haunting, compelling story that will resonate with listeners long after the last sentence is heard.